Hello hello! Today I have a quick post featuring a manicure I wore a couple of weeks ago (before trimming my nails down). It's a colour combination I'd had kicking around in my mind for a while, but I wasn't sure how I wanted to put it all together. Then one day it came to me! eww, tip wear. Damn you, topcoat. I knew I wanted to do a silver base with yellow on top. Here, the silver I used is two coats of a no-name from Hot Topic. I don't think they sell this brand anymore, but it's the kind with the bottles like this (image courtesy of Steph's Closet). It's a very cool metallic-foil shade with just the right amount of sparkle. I want a car in this colour! The small finger is painted with white + two coats of Orly Glowstick. Best neon yellow ever. It's SO BRIGHT and I'm glad it photographed properly here. 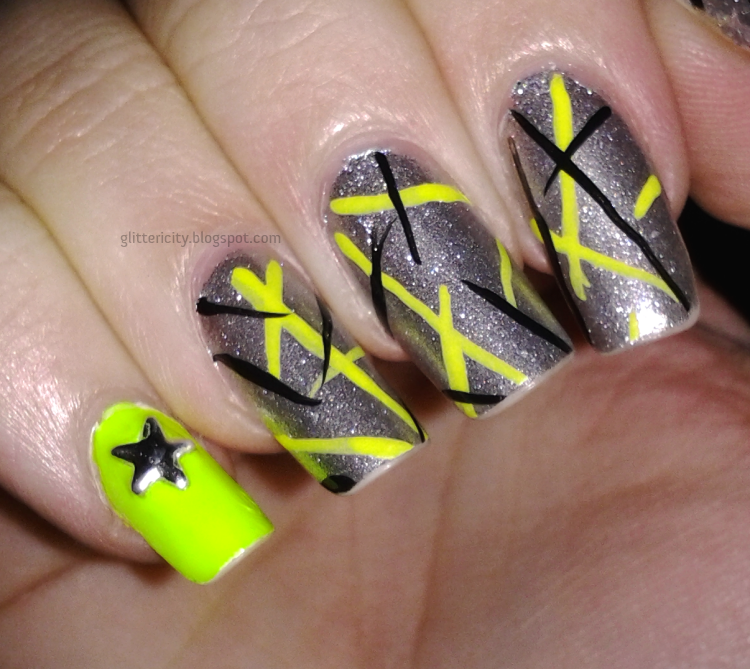 I then used yellow acrylic paint and a thin striping brush to paint on the random stripes. I wanted something kind of retro and laser-light-esque. The black was added at the end when I felt it just needed a little something else. The silver star-shaped stud is from this wheel I got at Born Pretty Store. 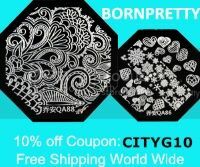 Before applying these, I press them against a pen and wrap it around to gently bend it into a curve that will fit perfectly against my nail. This way they stay longer and aren't catching on everything! It's all sealed in with Seche Vite, which unfortunately caused quite a bit of shrinkage with that silver. 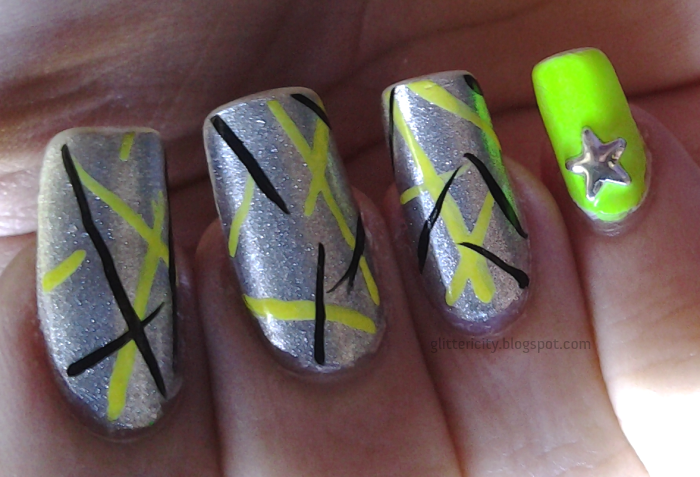 Sort of a dark awkward pic, because I wanted to show how much that neon yellow pops! It really lives up to the name Glowstick (though it does not actually glow in the dark).